The fairytale cup run has run its course for Alan Dowson's Cards, as a comfortable afternoon earned the Premier League outfit a place in the draw for the next round of the FA Cup. Woking of the National League South saw their FA Cup run dismantled by Premier League side Watford in front of a sell-out crowd at the Laithwaite Community Stadium. The Cards, headed by boss Alan Dowson, worked hard to unsettle their top-flight opponents however the gulf in class proved decisive as goals from Will Hughes and Troy Deeney sent Watford’s name into the hat for the Fourth Round draw on Monday night. Despite Dowson playing down the fixture in his pre-match interviews, the Woking faithful treated the occasion with delirious optimism and excitement. With cardboard cups and commemorative scarves aplenty, 5,717 fans welcomed the teams onto the pitch ahead of kick-off. The opening exchanges would set the tone for the rest of the game. A completely rotated Watford side controlled possession and kept their opponents glued to the defensive third, though they didn’t have an easy time in breaking down a resolute Cards defence. The deadlock was broken in the 13th minute with a well-rehearsed set-piece from the Hornets. Adam Masina drilled a corner to the edge of the box where Hughes, born just eight miles down the road, caressed the ball just inside of the far post. A minute later, forward Isaac Success picked up the ball and charged for the penalty area before tumbling to the ground in a dubious attempt to be awarded a foul — referee Graham Scott waved away the claims and booked the Nigerian for simulation. Hughes’ goal was an inevitable occurrence which dampened the infectious air of buoyancy around the stadium. However the sixth-tier side maintained their fighting spirit even with a gruelling uphill battle ahead of them, keeping the Hornets at bay until Tom Cleverley’s free-kick struck the crossbar not long before half-time. What was shaping up to be a dull Third Round encounter sparked to life in the second period as Woking endeavoured for an equaliser while Watford sought the insurance of a two-goal advantage. The Cards looked threatening in wide areas, particularly down the left through on-loan Maidstone United winger Jamar Loza. The Jamaican international set up opportunities for Jake Hyde and substitute Armani Little, however neither failed to beat Heurelho Gomes in the Watford goal. With 20 minutes on the clock, Javi Gracia replaced Success with Deeney while Sema came on for debutant Adalberto Peñaranda, two moves which proved key for the Hornets as they put the tie to bed. The Swedish international charged down the left flank and picked out Deeney, free in the six-yard box, to poke the ball into the open net. Woking had one final chance to score a goal of their own shortly before the end of regulation time as Christian Jolley crossed for Harvey Bradbury — the former Hornets youth player headed high and wide from close range. 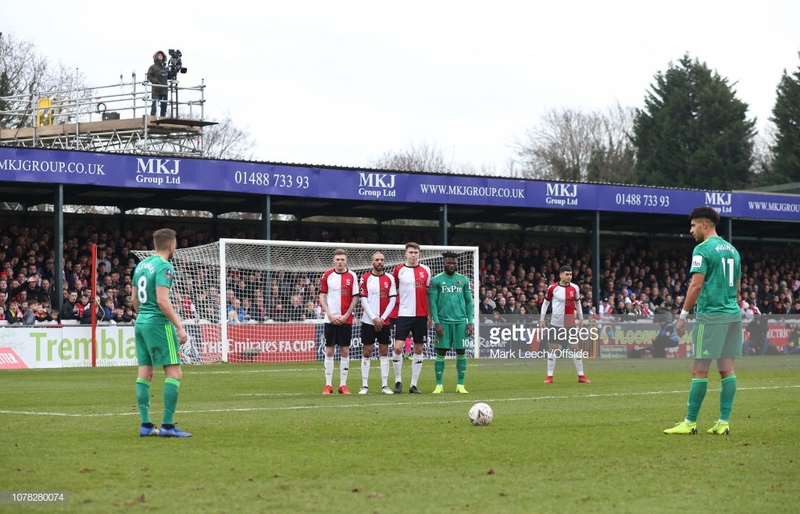 The inevitability of a Premier League side defeating a non-league outfit should not take away from the prestige of the occasion from a Woking point of view. A team of part-timers with a wide range of professions outside of football, the Cards pulled together to lock horns with players who have represented their countries and performed at the summit of European football. Meanwhile, the occasion was even more rewarding for Woking fans, who enjoyed the rare opportunity to witness Premier League footballers operate at their stadium, while the club gained renown and widespread mutual support across the nation as neutral fans watched on in the hope of another magical FA Cup giant-killing. Although it wasn’t to be on the pitch, the day remained one to remember for the football club as a whole. A travelling contingent of roughly 1,200 Hornets and all those watching from home will have been pleased to see Gracia and his players carry out an efficient, if not pretty, job on their opponents to reach the Fourth Round of the tournament. Having been dumped out of the Carabao Cup by Tottenham Hotspur in September, Watford will have aspirations of an honourable cup run to compliment their adequate league form so far in 2018/19 — the Hornets sit 8th in the table with prospects of finishing in a Europa League spot come the end of the season, though entry into the competition can also be granted by winning the FA Cup. Watford will play their drawn opponents for the Fourth Round on the weekend spanning January 26 and 27. Woking host Welling United in an important clash on Wednesday night as 2nd take on 6th in the National League South. Meanwhile, Watford travel to Selhurst Park to face Crystal Palace in the Premier League on Saturday afternoon.